This post goes out to my young old man, who just got his ticker fixed. I wanted to get this to you, Dad, while you were still a docile patient, but I’ve been busy: traveling first to Cleveland to see you, then to Florida for a wedding, and in between scrubbing the classroom dollhouse and nurturing newborn fish and baking birthday cupcakes (strawberry) for the five-year-old diva. I know it hasn’t been too much fun being you these past couple of weeks. Snow frosted the view outside your window, and Nurse Ratched was not the sunniest company. There have been aches and pains. The standard-issue attire was not your usual exuberant best, and the mandated accessories were even more appalling–no doubt you were delighted to shed them. Most dismaying of all, perhaps, was the abrupt switch from your usual epicurean standards. So let’s talk about something else for a bit, shall we? I think this would be a fine time to introduce our mutual friend, le Toc-Oeuf. For readers who may be scratching their heads right now, the Toc-Oeuf, if you have not seen one, could be considered among the cleverest or most pointless of utensils–depending on your needs. While I don’t have much patience for single-use gadgets in the kitchen (other than something like an oyster knife, which is the only way to get the job done), the Toc possesses a singular, streamlined beauty, and nothing else can quite accomplish what it manages to so elegantly do. Which is, if used properly, in a quick “toc!” to neatly snap a perfect little dome of shell off the top of an egg. Simple, yes–but not so straightforward. Retract and release with too much force, and you'll shatter the shell. Not enough, and you'll get the equivalent of a hanging chad. I've got the technique down and these days, I mostly wield it with a Sunday morning flourish to pop a portal into a soft-boiled egg. But I’m sure the inventor of the Toc intended a more refined purpose in far more rarefied settings when he or she first conjured this sharp little plunger of stainless steel. Dad and I first made the acquaintance of the Toc years back (was it really almost 10?) when we shared the privilege of spending a few days behind the scenes in the gleaming kitchen of L’Arpege, in Paris. L’Arpege, the Michelin three-star restaurant helmed by chef Alain Passard, had made headlines the previous year for banishing all red meat from the menu and focusing primarily, religiously, on the vegetable. If I recall, the news was scandalous, and many speculated that Passard was losing his mind. Cuisine végétale and la grande cuisine were phrases not usually uttered in the same breath in France, so you might imagine there was much scoffing and pfft-ing. But the concept worked. And Passard charges a pretty penny for his plant-centric creations. Classics include a whole, perfect beet roasted in a dome of sea salt, which is then cracked away à table to reveal the tender jewel within. Another favorite is an onion gratin cooked so slowly that the onions do not color at all but become sweet as dessert. Then they’re quickly fired with some very fine quality Parmigiano-Reggiano. Having worked in other restaurant kitchens, I was struck by the comparatively Zen quality of Passard’s kitchen. In most restaurant kitchens I’d experienced, there had been testosterone, cursing, red hot momentum. Here, the cooks worked with controlled, calm precision. Everyone was civil. Passard himself was gentle, kind-eyed, and quietly intense. I, a guest, was actually allowed to partake in tasks, such as slicing onions thin as grass blades for that famous gratin. One day I finished off a heap of onions, eyes streaming, and Passard himself approached to inspect the results. As my heart pounded, he sifted through my shavings of onions, then picked up the discarded root end of the vegetable, held it out with a raised eyebrow, and pointed out a section of usable vegetable I’d left around the root. It was a lesson–no one would have thought twice about throwing away what I had in an American kitchen, but in France there is more discipline, less waste. And I saw this economy and respect applied in other ways–sort of the vegetarian equivalent of nose-to-tail eating. For example, after tomatoes were blanched and peeled, the skins at L’Arpège were not chucked but chopped up very fine, slowly cooked, and spun into a vibrant filling for delicate ravioli. One of Passard’s signature dishes was and still is his amuse-bouche egg, the execution of which is made possible by–you guessed it–the Toc. 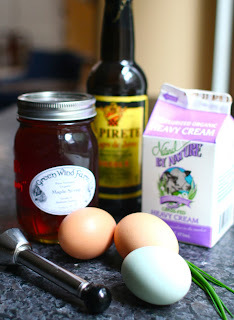 The egg yolk is coddled very slowly in its shell and topped with sherry cream, maple syrup, and a scattering of chives. There are variations–I recall he may have used avocado cream and pistachio oil during my visit, and I’ve lately read that he sprinkles in a little quatre épices (an Asian spice blend). But the important thing is always the maple syrup. With every guest receiving one of these delightful eggs as an introduction to the meal, dozens of eggs each morning have to be carefully toc’ed and settled back into their cartons again until ready for cooking (at which time they bathe and bob merrily in one of the gorgeous copper pots that adorn the kitchen). Someone has to do it. And, as temporary stagiers, we were handed the eggs and the Tocs, given a brief lesson, and entrusted with the task of crowning each egg with a perfect hole. We were also handed a razor blade to smooth out any imperfections. As it so happens, Dad turned out to be a whiz with the Toc. An absolute prodigy! He didn’t even need the blade (as I did) to salvage any borderline cases. As he would have it, he went down in toc legendry at L’Arpège. And of course, he took it upon himself to track down one of the gadgets for himself, and one for me. If you're up for trying this at home, now is the time. I checked on Amazon, several "egg toppers" are available there (the model I own was purchased at Mora in Paris). In the Northeast, maple syrup season has just wrapped up, the golden nectar freshly bottled. Use Grade A (medium or light) for this recipe. Chickens are venturing into the pastures, and chives are breaking through the warming soil. And Dad: there are also fish to catch, blue crabs to pick (and shedders to fry), corks to pull, mountains to climb, and flea markets to mine. Perhaps this year morels will be waiting for us in the woods. Take good care of yourself, and get back into shape for all the adventures ahead! *Subscribers: oops! I accidentally hit "publish" earlier without including recipe or pictures. Apologies if you get this twice. Place bowl in a freezer to chill. 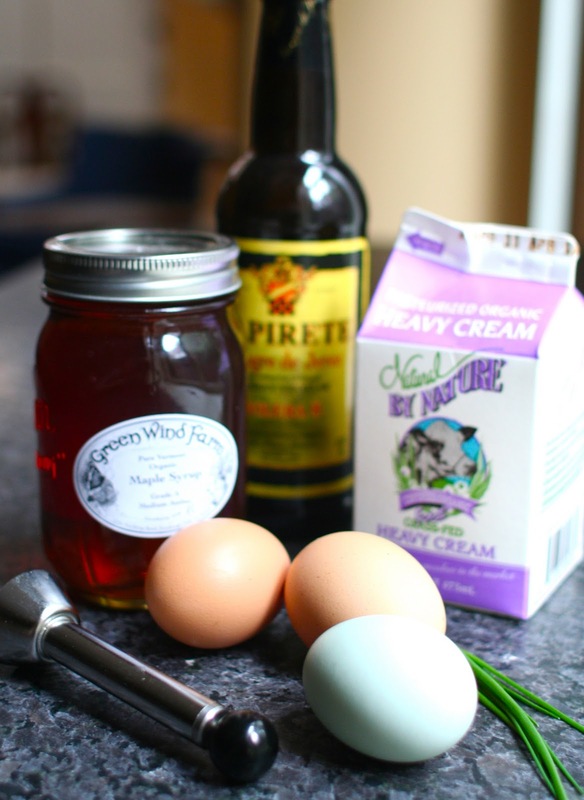 In the bowl, whisk cream until soft peaks form, then stir in sherry vinegar and salt to taste. Using an egg topper or Toc-Oeuf, remove top third of egg shell. Or, use a sharp knife. Carefully pour egg white out of shell, leaving yolk inside. Clean outside of shell with a damp towel, then set into egg cup. Repeat with remaining eggs. Using a shallow saucepan or deep skillet, pour in about 2 inches of water and bring to a gentle simmer. Carefully set eggs afloat in water and cook until yolk just begins to set around edges (watch carefully), about 3 minutes. Using your fingers, carefully remove eggs from water and set them into egg cups. Sprinkle each yolk with minced chives season with salt and pepper. Then, spoon whipped cream into the shell just to rim, and drizzle with maple syrup. Optional: top with a dollop of caviar.